In the last edition, Bro. Allen was reading from Ezekiel chapter 47 and speaking about the living water which will flow from beneath the temple during the Millennium. We are picking up where he left off. I want to show you this picture of the temple again. Now the water will come out of the temple area, by the side of the eastern door. Then it goes out and will flow down into the Kidron Valley. After you leave the temple area, there will be a cavern in there. The water will flow into that cavern, which it is very shallow at first, but it is a big stream. It will be very swift. Then it will go down into the valley, it mentions a thousand cubits, which will be fifteen hundred feet. Then it is getting deeper the further you get from the temple, because it is going through a valley. There is no valley there now. The Mount of Olives is in the way, but there is going to be an earthquake as I showed you before. As we read from Zechariah 14:5, it say the Lord himself will stand upon the Mount of Olives. That is the same place He left from. When he comes back His saints will be standing with Him. So, the Bride of Jesus Christ is going to be there to see what is taking place at that time. It is in that time when the mountain will have split in two, making the valley. That will take place to allow the water through. The water will get deeper and deeper until it gets to the Dead Sea. Then a second stream is going to the great sea, which is the Mediterranean. It is going to be a gusher. That is what it is going to be. Somewhere underneath Jerusalem today, the water is already there. There just has to be an outlet for it to come out. That outlet will let it come out and go through the valley that earthquake will make, which will be in a small way like the Grand Canyon. This is what it is going to be like. It looks impossible now, but with God all things are possible. As I said before, there will be trees on each side of the river all the way up to Jerusalem. It goes back to the brink of it, which would be the beginning. I wanted to say these things before I went on any further. I have a picture here of the temple area that I want to use. The area around the temple is kind of small compared to what it will be like in the Millennium. Because they have made this model according to their understanding of the temple in Herod’s time. They cannot imagine what it is going to be in the Millennium. They cannot imagine the circumference of it. So as we look at it, back here you have the Holy of Holies. Then you come on through here into the eastern gate. Then whenever the earthquake comes, it is not going to bother this. The earthquake will affect underneath this to bring the water out. Because it is under God’s control. How can He do that? How can he make a great earthquake, but leave this building standing? It is Him. The One that created the heavens and the earth. He knows what He is doing to be able to bring that out. He is going to bring the water out from here (pointing beneath the temple), it is going to come out flowing towards the east, and then it is going to change direction. The Mediterranean and the Dead Sea are fifty-three miles (85 kilometers) apart. From Jerusalem to the Dead Sea is twenty miles (33 kilometers). That is quite a long space. It calls it a river. They say in America in order to have a river, it has to be a hundred miles long. But God can make it anything He wants, because it is really going to be longer than that. Inside that river, as it comes out of the temple there will be a split. As it splits, half will go to the Dead Sea and the other half to the Mediterranean. God has it all figured out. He knows what He is doing. I have seen other people make pictures of the Holy of Holies, and in their picture they still have the ark of the covenant in there. The ark is not mentioned in Ezekiel anywhere. Because it is not needed. The sacrifice was already made and what will be done in this temple in the Millennium is to serve as a reminder to the living natural people. These that have gone through the tribulation and have accepted the Messiah: the 144,000 and the woman of Revelation 12, they have already accepted that He is the Messiah whenever Armageddon comes. They have already accepted that. But when you go into the Millennium, then you have the woman of Revelation 12, plus the other Jews that will still be living. As I have said, whenever you go to the 14th chapter of Revelation, then you see the 144,000 around the throne. In that, you have Jesus Christ sitting upon the cloud. He is sitting on the cloud with a sharp sickle in His hand. Why? To reap the harvest of the earth, which will be the 144,000. I cannot help if I get criticized about it. That is the way it is, because they are the only ones that can sing that song around the throne, the 144,000. It is a special song for them. It is not something that somebody wrote up or made up, but it will be something that will come out of their hearts. I want to talk now about the sons of strangers, as we see it in Isaiah 60:10. And the sons of strangers shall build up thy walls, and their kings shall minister unto thee: for in my wrath I smote thee, but in my favour have I had mercy on thee. Let us look also at Ezekiel 47:22-23. And it shall come to pass, that ye shall divide it by lot for an inheritance unto you, and to the strangers that sojourn among you, which shall beget children among you: and they shall be unto you as born in the country among the children of Israel; they shall have inheritance with you among the tribes of Israel. And it shall come to pass, that in what tribe the stranger sojourneth, there shall ye give him his inheritance, saith the Lord God. There we see the sons of strangers, which will be people who are living now. I remember Bro. Jackson going over that. They are a smart bunch of people. What they have done, they have put their minds to understanding instead of walking the streets, demonstrating like they have here. America has lost its equilibrium because young people do not even believe in God now. But it is going to be the sons of strangers as Bro. Jackson explained. They will be from India, which has very smart young people. And from China, from those eastern peoples. These are people who had no relations with Israel in ancient times. They were strangers. Bro. Jackson said they will break away from their parents and from their parent’s religion. I saw something showing Buddhist temples in China and in India. They were showing some of them, they were built to be something at one time. But these young people say, I do not believe that anymore. It has not brought us anything. It has not brought us life. It has not brought us happiness. It has all been sadness. So, they will break away from their parents. They will say, “The God of Israel is the only God. That is where God is working, Israel.” They will say that as they see the hand of God work in the last days. So that will be the sons of the strangers. These will be the ones that will be accepted into Israel as citizens. They will have their citizenship there, they will have their children there. No doubt, they are going to live among themselves. Because it calls them strangers, they remain somewhat distinct from the rest. The thing about it is, they are the ones that build up Israel’s walls. They are the ones that have been a blessing to Israel because of their ingenuity. There are no smarter people on earth tonight than the people of Israel, but they are not builders so much. They are scientists, people of knowledge, medicine and things of that nature. But in Israel, there will be farmers, some of them. Israel has never been that great at farming, because they had so much trouble in their land that a lot of it was war, continual warfare. Of course, that is because they made a mistake. They made a big mistake because they took those people that were in the land, which they were to get rid of, and made them pay tribute and work for them. That is when Israel first began, whenever they were in the land, they made these people to be the farmers, or shepherds, or whatever. Right now, in Israel, who has the sheep? Who has the goats? It is Arabs. This is the way it is. But Israeli farms now are producing, and I am not saying there will not be farmers, but there will be people there that God has put in their heart to fulfill His will to do the right thing, which are not all Jews. Israel is going to have the leadership in the Millennium that will recognize people that have done something for the Jews. Most Jews today over there are melancholy. I am not saying they will be then, but now they are because they are willing to give up land. The northern people especially are willing to give up what they have in order to have peace. You cannot have peace with those Arabs. I am not saying every Arab, but that aggressive Muslim type Arab is not peaceful. They will never have peace as long as they are there. That is why they will be far removed. God will get rid of them in the time to come. 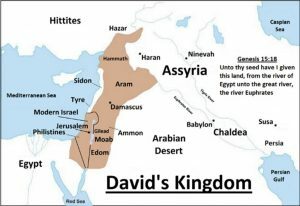 David’s Kingdom of United Israel. Click to enlarge. Israel in the time of Joshua. Click to enlarge. See? Everything to the sides of the city will be for the prince. You can see here Benjamin has changed places from the Old Testament times. Before he was on the north side of Judah, but in the Millennium he will be on the south side. So God is going to give this land to Israel and it is going to be prosperous just like it was before the Dead Sea became dead. He will heal that land with the water that flows from beneath the temple. He is going to send healing water. Now it goes into the other tribes. “And by the border of Benjamin, from the east side unto the west side, Simeon shall have a portion.” See? Simeon is next to Benjamin now. Instead of next to Judah he is next to Benjamin. “And by the border of Simeon, from the east side unto the west side, Issachar a portion. And by the border of Issachar, from the east side unto the west side, Zebulun a portion. And by the border of Zebulun, from the east side unto the west side, Gad a portion. And by the border of Gad, at the south side southward, the border shall be even from Tamar unto the waters of strife in Kadesh, and to the river toward the great sea. This is the land which ye shall divide by lot unto the tribes of Israel for inheritance, and these are their portions, saith the Lord God.” See? It is Him speaking. After it is all finished, He is speaking to Ezekiel. He says this is Thus saith the Lord. From chapter 40 through 48, this is God speaking about the land, about the holy portion, about the temple, and about the dividing of the Mount of Olives. This is all thus saith the Lord. Here it goes a little further. “And these are the goings out of the city on the north side, four thousand and five hundred measures.” See? It goes back to talking about the city again. This is the portion of the city that belongs to the children of Israel. How can we tell that? “And the gates of the city shall be after the names of the tribes of Israel: three gates northward; one gate of Reuben, one gate of Judah, one gate of Levi.” See? Levi is mentioned again because of the twelve tribes of Israel. He is not mentioned when the land is divided, but he has a gate there, one of the gates. His portion is in the city. I have done gone over that four thousand, five hundred, which is right in the middle of the portion that is for the city, which is the profane place as it says. “And at the east side four thousand and five hundred: and three gates; and one gate of Joseph, (Now he is not mentioning Manasseh or Ephriam anymore because he is bringing it back in line of how it started. In Joseph there are two tribes, but it goes back to the singular. Why? Because Levi has his portion inside the city, and a gate is named after him. Does it make sense? One gate of Joseph…) one gate of Benjamin, one gate of Dan. And at the south side four thousand and five hundred measures: and three gates; one gate of Simeon, one gate of Issachar, and one gate of Zebulun.” The south side. “And at the west side four thousand and five hundred, with their three gates; one gate of Gad, one gate of Asher, one gate of Naphtali. It was round about eighteen thousand measures: (That is going all the way around the circumference of it now, which is eighteen thousand. Four thousand five hundred times four. God knows His measurements. He is a Scientist. He has a laboratory that you would not believe. He made the world out of His laboratory. If they say it was caused by an explosion, there had to be something there to explode. It was not a mistake. God did not get burned. He was before everything. And you were before everything. You were in His thoughts before He ever made anything, before there was ever a big bang, before He ever did what He did, you were already there. Why? It was like a man sitting down with a blueprint. Only God is using His blueprint for stars, for the moon, the sun, and for everything out there. He was thinking this, but you were before that. Why? This all has a beginning, but you were in eternity. You were in God when He created this thing. It was round about eighteen thousand measures…) and the name of the city from that day shall be, The Lord is there.” The Lord is there. That city will still be there whenever the Millennium is over. You see in Revelation when Gog and Magog approach the holy city, it is Jerusalem. It is still there. I love the word of God. I appreciate His word. Layout of Jerusalem in the Millennium. Click to enlarge. I am going to go back over some of this again, because I know some had questions which I want to answer, concerning the latter part of chapter 48 where the land is portioned out. I have this map here which can help you understand. It gives you an idea of how the land is portioned out. You have got a rather large plot of ground there that has been designated for the temple area. Here is the holy portion, which belongs to the sons of Zadok all together. Then you have a portion here, as you read, this belongs to the Levites, which Zadok is part of that tribe, but these went astray. Then you have got the city here that is left, which we have gone over. They have the land between the Dead Sea and the Mediterranean Sea. There will also be a long river of water, from the Dead Sea to the Mediterranean, but that is not on our map. This all comes from underneath the altar. Let me read this portion here which explains that. Start with verse 21. “And the residue shall be for the prince, on the one side and on the other of the holy oblation, (On the other side of the holy oblation (pointing to both sides of the city) would be for the prince, or as I have gone over, the high priest. This is the land that is designated to him and his sons. In the Bible, the inheritance goes to the sons. In Israel today, they are making women priests and rabbis and everything else, because of the pressure that is being put on them. But whenever the Millennium comes, there will not be that kind of pressure. Because God is going to be Father and Jesus Christ will be Lord. He is our Lord because He is our Saviour. We baptize in the name of Jesus Christ. When we pray the prayer, we pray in the name of the Lord Jesus Christ because He is our Lord. He is our overseer. God is also Lord, but He is Lord of the whole universe, or the whole creation. Jesus Christ will not be Lord over the whole universe, He will be Lord over the earth during the Millennium time. Then it goes back to the Father after that. So, we see here, the residue shall be for the prince, on the one side, and on the other of the holy oblation…) And of the possession of the city, over against the five and twenty thousand of the oblation toward the east border, and westward over against the five and twenty thousand toward the west border, over against the portions fore the prince: and it shall be the holy oblation; and the sanctuary of the house shall be in the midst thereof.” The sanctuary of the house shall be in the midst of this. It does not tell you what kind of a measure this is here, but it is reeds. “Moreover from the possession of the Levites.” God has a great remembrance. He remembers, why? Why does He do this? He sees that the hearts of these Levites are not the same as in the hearts of the sons of Zadok, when it comes down to the last time in the Millennium, because there is a spirit that goes with this. Everything is guided by a spirit. The spirit, the makeup of the spirit in these Levites, is different than the makeup of the spirit in these sons of Zadok, because of their love for the things of God. That is just like it is with the Bride of Jesus Christ, and then the foolish virgins, and the great multitude. There is a difference between these groups. There will continue to be a difference. Let me say this: when you look at Revelation 21 on into 22, you see the same thing, there is still a difference. The Bride of Jesus Christ will no longer be Bride in the Eternal Age, but there is still going to be a difference. There will always be a difference in the Bride people. She will not be called the Bride in the Eternal Age, but there will always be a difference in her compared to the great multitude or the foolish virgins, because of the obedience in the time that we are living in. You can see why the scripture says that there were ten wise and ten foolish. The wise, as Bro. Jackson went over it, are not going to be a very large group. If you listen to Jim Baker and all those preachers, they have millions or even billions of people that are going to be a part of the Bride. They do not know how to separate it out. The Bride of Jesus Christ is going to be few. So, will the foolish virgins be few whenever that time comes. I know Bro. Jackson explained it and said there will not be thousands in America, but only hundreds. Outside of America, we do not know then just how many there will be there, but it will be few in number also. We do not know them all. You might say, well you are making it pretty straight who Bride is going to be. Let me say those that are getting the word, those that are getting the Contender, those that are getting truth over the internet, those that are part of the churches in fellowship with us, and outside that, there is no great deal of Bride people out there anywhere in the world. Jesus said there will be few that will find it. Few that will find it. What about the rest of them? They did not find it. They did not find it convenient. It was just a little more than they could stand, so they raised up against it. Whenever I say this, there is not a bunch of different truths. There is only one truth, only one word. You might say, well you are narrowing it down. I am narrowing it down to a group of people that will listen to truth. Whether this bothers you or whether it does not bother you, I cannot help that. There is way that seems right unto man, but the end of it is separation from the true Bride of Christ. “Moreover from the possession of the Levites, and from the possession of the city, being in the midst of that which is the prince’s, between the border of Judah and the border of Benjamin, shall be for the prince. As for the rest of the tribes, (We go back to the map now, this is the city that is the profane place. This other area is for the Levites, this middle area is the sons of Zadok. See? This is square, twenty-five thousand reeds each way. If you want to dispute what I am saying about reeds and cubits, what are you going to do about Revelation 11? He told him to get a reed like unto a rod and to measure the temple. Measure the temple and the altar and them that worship therein, which would be the sons of Zadok. They are not measuring to see how long they are. They are counting them. That is really what will happen: they will count a certain number that will be there. We look at it that way. As for the rest of the tribes…) from the east side unto the west side, Benjamin shall have a portion.” In our picture, you can get an idea of how this land will be divided between the tribes. The Levites, the sons of Zadok. Here is the city. This is the city here. Judah has this much. Really this city is in the Judah part. Jerusalem is always in Judah. Immediately after you get out of the city. It is north from the city; the city part. From the east side unto the west side, Benjamin shall have a portion. This is different than in Old Testament times? Simon and Judah, all the way down from Jerusalem. I went over this before. It was this way because during Old Testament times, and still today, this whole bottom part of Israel is a desert. The mountains in Israel are getting very little water in the desert portion. In ancient times you had only Simon and Judah in this southern area. Then you had all the other tribes north of Jerusalem. But in the Millennium it will be different. Instead of two tribes south of Jerusalem, there will be five tribes south of Jerusalem. How will this be possible? This is just a desert today. It will not be a desert anymore in the Millennium. God is going to change the situation. Because God is going to breathe on this area. You start out here with Dan, Asher, Naphtali, Manasseh, Ephraim. This is where the two portions of Joseph are, the two sons of Joseph. That is the two portions. You do not see Joseph mentioned in here, because Manasseh and Ephriam are Joseph. You come on down to Reuben, then Judah, then go below that and you have Benjamin, Simeon, Issachar, Zebulun, and Gad, all the way down close to Egypt. “And by the border of Benjamin, from the east side unto the west side, Simeon shall have a portion. And by the border of Simeon, from the east side unto the west side, Issachar a portion. And by the border of Issachar, from the east side unto the west side, Zebulun a portion. And by the border of Zebulun, from the east side unto the west side, Gad a portion. And by the border of Gad, at the south side southward, the border shall be even from Tamar unto the waters of strife in Kadesh, and to the river toward the great sea.” Right now, as you look at it, there is no real river that runs through there because it is desert. But God is not speaking of now, He is speaking of the time when this is all going to be restored. As I said before, I will say again, the only time that Israel ever had her land was in David’s time which reached on into here. “This is the land which ye shall divide by lot unto the tribes of Israel for inheritance, and these are their portions, saith the Lord God. And these are the goings out of the city on the north side, four thousand and five hundred measures.” That is why I said, the city is next to Judah. These are the goings out of the city on the north side. It goes north. “And the gates of the city shall be after the names of the tribes of Israel: three gates northward; one gate of Reuben, one gate of Judah, one gate of Levi. And at the east side four thousand and five hundred: and three gates; and one gate of Joseph, one gate of Benjamin, one gate of Dan.” You see here there is a portion of land for Dan in there. If you go to Revelation 7, Dan is not mentioned as part of the 144,000. So, we can see Dan is still there, but he was excluded from being part of that number. You see also here there is a gate of Joseph, which would be for the two tribes: Manasseh and Ephriam. Joseph is brought back into the picture here, as the father of Manasseh and Ephraim. One gate for Joseph, one for Benjamin, and one for Dan. “And at the south side four thousand and five measures: and three gates; one gate of Simeon, one gate of Issachar, and one gate of Zebulun.” Why would it mention Judah for the north side? Because he is north of the city. It covers this whole thing, but it is north of the city. At the south side four thousand and five measures, and three gates, one for Simeon, one for Issachar and one for Zebulun. See? These are all gates to the city where you come in from the holy portion, then from the rest of it. “At the west side four thousand and five hundred, with their three gates; one gate of Gad, one gate of Asher, one gate of Naphtali. It was round about eighteen thousand measures: and the name of the city from that day shall be, The Lord is there.” So, that will be the name of the city because from that time on the Lord is there. As you look at this, you have three gates on each side of the city. Do you understand that? Or is it still as clear as mud? In order to show this picture, God spent much time from verse 10 through 22 just talking about what is going on in Judah and this city. The entire thing is actually forty-two miles square. I mean the whole of it all. But this main part of the city is smaller and has a circumference of eighteen thousand reeds. See what he has done, he has taken the whole thing, four thousand five hundred, four thousand five hundred, four thousand five hundred, and four thousand and five hundred. 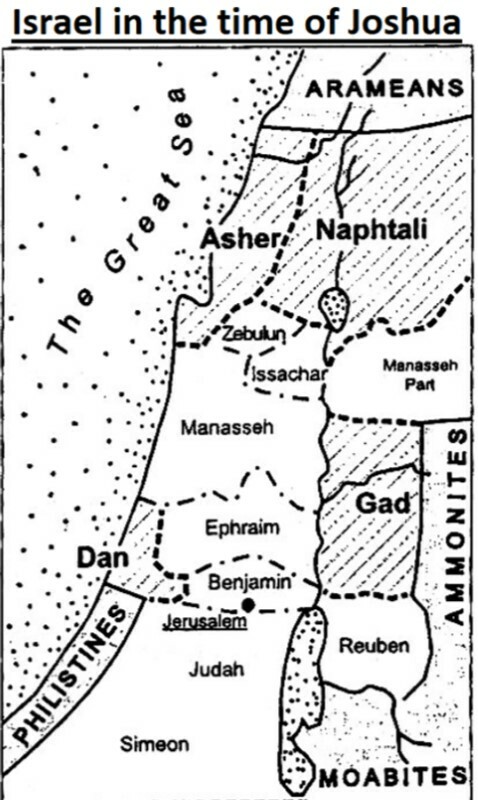 Add that up, you have gone all the way around this portion (pointing to the city portion next to Judah) of the city and it is eighteen thousand reeds. I want to go back to Zechariah for a few minutes. Zechariah 14. When I was last there, I stopped at the 8th verse. I was dealing with the river that issued out. It is a river, it is not a little stream. It is not a little branch because it said by the time it gets to that mile and sixteenth, what is it? It is a river that you can swim in. Let us look at that again. “And it shall be in that day, that living waters shall go out from Jerusalem; half of them toward the former sea, and half of them toward the hinder sea: in summer and in winter shall it be.” I was asked a question one time, will there be summer and winter in the millennium and eternal age? I had to think. That has been a few years ago. I had to think, then I thought of this verse. Summer and winter. Then later I found in Genesis chapter 8, verse 22, “While the earth remaineth, seedtime and harvest, (That goes into the Eternal Age.) 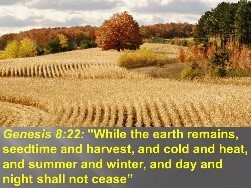 and cold and heat, and summer and winter, and day and night shall not cease.” As long as this earth stands. Why? Why does it take winter? Why are the ice caps there? We had cold weather here recently. It did not come from Canada, it came from further north than that. It is God’s ice box to keep coolness upon this earth. You have the north pole, you have the south pole, summer and winter. Now I want to go to verse Zechariah 14:9 which I did not include last time I read over that chapter, because I had a purpose in it. See? God will take a verse and make it stick out. God does it that way, because it is eternal. This goes beyond what he is talking about in verse 8. “And the Lord shall be king over all the earth: (That is not the Millennium, because Jesus Christ is going to rule and reign throughout the Millennium. Then when you come into the Eternal Age, it is going to be God, as it is recorded in the 15th chapter of 1st Corinthians. He must rule until every enemy is under His feet. The last enemy is death. That is the last enemy and death will be done away with. See? We are in the Eternal Age now. Let me finish reading this. The Lord shall be king over all the earth…) in that day shall there be one Lord, and his name one.” It all goes back to God. Let me go to 1st Corinthians. What did I say when I began to talk about this? What is my subject? The Millennium and Beyond. The beyond is what we are talking about right now. 1st Corinthians 15:20. “But now is Christ risen from the dead, and become the firstfruits of them that slept.” He was the first one to ever raise from the dead to a glorified body. Not the first one to be raptured, because you have Elijah and Enoch. They are in heaven. But Christ had to be the first one to raise from the dead. These did not raise from the dead. They did not die. “For since by man came death, by man came also the resurrection of the dead.” He is talking about Adam and he is talking about Christ. “For as in Adam all die, even so in Christ shall all be made alive. But every man in his own order: Christ the firstfruits; afterward they that are Christ’s at his coming.” That is Bride people. “Then cometh the end, when he shall have delivered up the kingdom to God, (That is after the Millennium.) even the Father; when he shall have put down all rule and all authority and power. For he must reign, till he hath put all enemies under his feet. The last enemy that shall be destroyed is death. For he hath put all things under his feet. But when he saith all things are put under him, it is manifest that he is excepted, which did put all things under him. (That is Jehovah. God himself is not put under Jesus Christ) And when all things shall be subdued unto him, then shall the Son also himself be subject unto him that put all things under him, that God may be all in all.” This be at the start of the eternal age. What a day that will be, when my Jesus I shall see, when I look upon His face, the One who saved me by His grace. When He takes me by the hand, and leads me through the Promised Land, what a day, glorious day, that shall be. I have one question given to me on 2nd Thessalonians, 3rd chapter, verse 14 and 15. In the 13th verse Paul said, “But ye, brethren, be not weary in well doing.” The question comes from the 14th and 15th verses. “And if any man obey not our word by this epistle, note that man, and have no company with him, that he may be ashamed.” Then the 15th verse, in other words, if somebody disagrees, then let them sit, do not bother them, let them go ahead and do their thing. “Yet count him not as an enemy.” That is someone that stays around but is not accepting what Paul said in his epistle. It is not someone that leaves. It is somebody that stays around and has not walked off, but they are thinking about it. Maybe their mind will change. He said admonish, or speak to him as a brother, that he may change his thinking. But if not, then you have to go to the 6th chapter of Hebrews. Then if he disobeys, then you turn him over to the devil. These things are sometimes hard. But if you leave because of truth, you plan another strategy and plan another way, then you have left truth. But he is talking about the scripture here just as much as it was when the scriptures went over the third day. There were people that did not agree, but they stayed around until they did come around. You do not always know who that person is, but in Paul’s example, this person has made it known that they have disagreed with what was said. But there are people who have disagreed, but they stayed around until they got understanding. I appreciate that, that it was not just something that they walked off from and said, well this is wrong, and I am not going to have anything to do with it, and I am not going to have anything to do with Faith Assembly. That is what Paul is speaking about. He is not speaking of someone who has rejected truth and left the fellowship. Let us go to Daniel now. When you look at Daniel, how old do you think these people were? The three Hebrew children. They are the seed of Abraham, they could be ninety years old, but this is not the case. Do you know how many years the book of Daniel covers? The period of time when he was prophesying and seeing visions? It was more than seventy years. It does not tell of him dying, but it does tell how long he sat in counsel, all the way to King Cyrus. If we add up the years, we see it was over 70 years. He went through three kingdoms, and by the end he is an old man. He never goes back to Jerusalem. Where is he at whenever he begins to prophesy in the 8th chapter? He is in Shushan (or Susa), which is Elam, and that is in what we call Iran today, which is Persia. He was way up in Persia, all the way across the Euphrates River. That is where he is giving the prophecy. How did he end up there? He has moved from the Babylonian region unto the Persian region, Medo-Persia. Not everybody was living a pleasing life before God at that time. The three Hebrew children, Shadrach, Meshach, and Abednego, they were living for God in a way God was pleased, but nobody equaled that of Daniel. Even the angel Gabriel comes to him in the 9th chapter and said, “a man well beloved”. It takes something for an angel to say that. It means that he had a lot of dedication and had gone through many trials. There are two occasions where this is mentioned, and probably more than that. Two occasions mentioned that his life was in jeopardy. Outside of those things the bible tells us, we do not know what other struggles he faced. But we know he was a victorious man. I remember when Bro. Jackson was at the Tabernacle and preached about the image that Nebuchadnezzar set up, and explained it was an image of Daniel. He was not permitted to preach there very many times, but I was there to hear him on a couple occasions when he did. Matthew 13, concerning the seven church ages, is another message he preached at the Tabernacle. It was just amazing what God showed him. How he came through trials as he did. Many of his friends turned on him. I remember him talking about it. I remember the Martin brothers at the Tabernacle. You did not hear of them much after Bro. William Branham passed away. In just a few months they were gone. Why? Why were they gone? Because they would not recognize truth. I do not care to talk a little about this, because I learned much from my brother as he taught us here for years. He brought out those deep things of God. I always said Bro. William Branham brought an outline and Bro. Jackson filled in the outline. I was thinking about it. Young people: do you know how old Daniel was when the book of Daniel begins? He was a teenager. It is time you begin to think who you are, who you are in the company of. You are in the company of saints. That little old device you fool with is not worth it. Anything can be found on those devices. God help you if you are watching that. It is dirt, it is filth. It is the trap of Satan. Your phone is not a trap, but if you begin to look into these things wicked things that you can find with it, it is trash. It is worse than trash because it has a spirit behind it. I do not care where you are at. I do not care who you are. Young man, if you are seeing a sister and you have anything else on your mind other than to treat a young lady, a young sister, any other way than what is right, then God help you. The devil has traps. They are already set. Sometimes I have mice that get into my house. I was using traps and put peanut butter on them. Mice like peanut butter. They get the peanut butter and eat it, but they managed to not spring the trap. A few weeks ago my son Mark told me, “I have one that will catch that mouse, I will let you use it.” It was something with a little hole in it and it had catches all around it. I put peanut butter in it and then put a peanut in the middle of that peanut butter. I caught two mice and the peanut is still there. It is easy to set, there is a little lever to pull up and it is set. What am I saying? I am not talking about mice. I am not talking about mouse traps: but the devil has that kind of trap. You will never get what you want in the flesh. You may get something, but that will not satisfy you. Why are you talking like this? I have a reason. Things in the world are getting worse and worse. We are able to see and understand the word of the Lord to know why these things are happening, but there are so many today that do not even know what is going on. The church world is looking for a great revival. They have been looking for a revival for forty years now. They keep putting it off down the road somewhere. The Lord is fulfilling His word. He is letting them enjoy what they are thinking about, but it will never come. There will be a revival alright, but it will be a revival for the Bride and a revival for the Jews. As far as the world’s revival, they have already had what they are going to get. I do not care how much they boast about it or how much they say it is coming, many of them are going to be in the tribulation looking for a revival. They will still be looking for it in the tribulation because they think the coming of the Lord is going to be at the end of the tribulation. It will be, but that is not when he is coming for the Bride. We have words that prove that. We thank God for His stabilization in this time of great perplexity throughout the nation and throughout the world. The scripture says men will get more wise and more wicked. You see man’s wisdom in the world today. If you have a new iPhone, next year it is obsolete. Of course, you can still use it, but they have moved beyond it so much. What it is speaking of is scientific wisdom. Silicon Valley and all that stuff promotes change, the change is such that whatever device you have got is not going to be working very well within another year. It is advancing that fast. Today, the computer power you have in your phone would be the same as a computer that would fill this room had forty years ago. These things have been made smaller, faster, better. This part of my message will be a little different. I am not leaving my main subject, but there are some things I want to bring in here because of what is going on in the world today. I am looking at the coming of the Lord and the catching away of His Bride. There is much being said today on television on this topic lately. They say the tribulation will come and go before the Bride leaves. They are looking at Matthew 24:27-31. I am going to look at the scripture and others, to show you the truth in case something they are saying has disturbed you. Some people may be persuaded by these television preachers to think we have been mistaken on when the coming of the Lord will happen. But we are not mistaken. We have truth. Those that once believed it was pre-tribulation, now believe it is post-tribulation. They are trying to take the scriptures and prove it. Really, the scriptures they use to “prove” they are right concerns the Jews, the foolish virgins, and those that are killed during the tribulation. Those people do not go in the rapture. We have scriptures that prove what is true. They think they can take 1st Thessalonians 5, and just annul that, and pretend it does not exist. They say this is the only scripture that people have in this hour to prove there is a rapture before the tribulation. What a mistake they make! How in the world is the Bride going to be here during the tribulation and then come back with the Lord?! How in the world are they going make that work? It makes no sense. How can we return with Him, if we never left? I will ask them that question, but they will not believe it because they do not believe in the catching away. But we know better. Both Matthew and Luke tell you: there will be two in the field, one will be taken and the other left. I wonder why one gets left? Two will be grinding at the mill, one will be taken and the other left. Two will be in the bed, one will be taken and the other left. This shows it is a worldwide thing because the grinding at the mill comes in the daytime and the bed at night. It shows there will be Bride people all around the world that will go. I will go further into that later. I want go to one of their famous scriptures first in Matthew 24, the one they rely on the most to try and say there is no rapture before the tribulation. We are the most fortunate people in the world. God has dealt with us in a way. Not in the great way that they are looking for: healing and all that they talk about, giving people eyes that they have never had, and giving people legs that have been chopped off. They say they have all these things, but they really show nothing to prove it. It is a thing to catch people. One evangelist was asked about these things because they proved his healings were a hoax. He tried to explain it away. He said, “you take somebody who has nothing wrong with them and put them in a wheel chair and you roll them up front and talk about them being able to walk, then they pray for them and they get up and walk.” He said letting people see the fake miracle will help increase their faith. There are many kinds of gimmicks in the church world today. Some do not pretend miracles because they just have a social gospel they feed to the people. They come in and pay for their seats, to have their entertainment. They get about forty-five minutes of singing, jumping, and men shaking their long hair. You cannot even see their face. I saw a man once, you could not see his face, his hair was right down covering his face. You could not tell whether it was a man or a mop. I would rather think it was a mop. There are just so many gimmicks. They have taken Hollywood ideas, then ideas from the Barnum and Bailey Circus into the church, or what they call the church. I saw one church that had a big fish tank in front of the church. It cost a million dollars. Around the door, it went all the way around, and a big fish was swimming in that. This is to draw crowds. We are not interested in crowds. We are interested in saints of God, somebody that is going to believe the word and grow by it. We are not going to pay any attention to this foolishness out there in the church world. Such foolishness like thinking the Bride is going through the tribulation. The Bride is not going through the tribulation. They are going to leave here before that happens. I have scriptures to prove what I am saying. I am going to go over this because there is so much teaching otherwise today. But it really is foolish what they say. They say they are going to build a temple, and it is going to be a shared arrangement with the Muslims. They are going to have their mosque and everything right there on the temple ground. They say that north of the mosque there is enough room to build a temple. They do not even know what they are talking about! That ground is going to be leveled off. Where do they get such a foolish idea? Today they are still looking for the ark of the covenant. What they have done, they have made another ark. God does not need an ark. He will not need an ark in the Millennium. That is why it is not pictured through the scriptures from chapters 40 through 48 in Ezekiel. Jesus Christ has already died. Jesus Christ has done fulfilled all that. They can build all they want to and put things wherever they want to, but it is not going to be there during that time because it is not necessary. It is not needed. If it was, then it would be in Ezekiel, but it is not. It is just another foolish idea that the church world has. That is what man does. He keeps looking for something that is not there. He gets lost in the maze of it all. Let us go now to Matthew 24. This is one of their favorite scriptures to prove that the church will go through the tribulation. Verse 27, “For as the lightning cometh out of the east, and shineth even unto the west; so shall also the coming of the Son of man be. For wheresoever the carcase is, there will the eagles be gathered together.” Now this is Bride people. As He comes in the flash, it is a flash of His coming for His Bride: as the lightning. What does it say? As the lightning cometh out of the east, see? This is going to be the way the Lord comes back. It started out in the east and it has gradually gone to the west. So, the flash of lightning is here and gone. It does not stay.. As the lightning cometh out of the east and shineth unto the west, so shall also the coming of the Son of man be. Not north to south, but east to west. Because that is where the gospel started. Bro. William Branham said it went from the east all the way to California, then you back to east again. Wheresoever the carcase is, the carcase, what is the carcase? Does anybody know what the carcase is? It is the word of God. That is where the saints of God are going to be gathered, eating. That is their meal ticket. That is what is going to take them up. Listen to what He says after this. “Immediately after the tribulation (See? The Bride was already raptured before you even get to this verse. That had nothing to do with the tribulation, but this next part does. Immediately after the tribulation…) of those days shall the sun be darkened, and the moon shall not give her light, and the stars shall fall from heaven, and the powers of the heavens shall be shaken. And then shall appear the sign of the Son of man in heaven: (He has done come once. Think about it. Get it in your head. What did He say in verse 27? For as the lightning cometh out of the east, and shineth unto the west, so shall also the coming of the Son of man be. That is for His Bride. But then you have the tribulation. Then, immediately after the tribulation of those days shall the sun be darkened, and the moon shall not give her light, and the stars shall fall from heaven and the powers of heaven shall be shaken. That is Revelation 6:16-19. Then shall appear the sign of the Son of man in heaven. Who is with Him? His Bride is with Him, according to Revelation 19:11-14.) and then shall all the tribes of the earth mourn, and they shall see the son of man coming in the clouds of heaven with power and great glory. And he shall send his angels with a great sound of a trumpet, and they shall gather together his elect from the four winds, (Who is going to do that? Who is going to gather together His elect? Not Jesus, the angels. He shall send His angels with a great sound of a trumpet, and “they” shall gather together His elect from the four winds…) from one end of heaven to the other.” The Bride of Jesus Christ is getting ready to rule and reign. They come back with Him, just as it said in the Daniel 7. Let us go to Matt 24:38. “For as in the days that were before the flood they were eating and drinking, marrying and giving in marriage, until the day that Noah entered into the dark. And knew not until the flood came, and took them all away; so shall also the coming of the Son of man be. Then shall two be in the field; the one shall be taken, and the other left.” Why is one left? It is not speaking about a saint being left. But you must work with somebody. You have to work with the world. They may even like you. They know who to go to for prayer when they need it. They do not even go to their preacher because he is just a soothsayer. They do not go to him for answers. “Two women shall be grinding at the mill; (Some of you sisters that have to work. Bro. Jackson made a statement on this one time. He said, “Maybe Bro. Allen will be working at Ford, he will go on break and he will not come back.” Somebody may just turn around and still be talking to you. Then they turn around again, and you are gone. There is a real coming of the Lord for His Bride. He is not worried about what the world thinks about it. What do you think that person is going to do? They are going to go looking for you. They looked for Elijah, against Elisha’s word. They looked for Enoch because it said he was not found. This world is going to be missing something when the Bride leaves because that is what is holding the glue together. Until that Bride gets ready, and God is doing it. Until the Bride gets ready. He is readying her at His pace. It is up to us to walk in truth and to live that truth because He knows at the point of Ephesians 4:12-13-14, whenever it is fulfilled. Whether you think it is too hard, it is for perfection. He perfects it through His ministry, a fivefold ministry, through His word. Through the ages of time people have picked their ministry. I like this one, but I do not like that one. You better love the fivefold ministry that stands before you and tells you the truth. Two women shall be grinding at the mill…) the one shall be taken, and the other left.” Do you think people will be grinding at the mill and in the field during Armageddon at the end of the tribulation? Then He gives a warning. “Watch therefore: for ye know not what hour your Lord doth come.” He is not speaking of days there. He did not say what day or what year or what month. Here he brings it down into the hour. In Luke it tells the same story except it adds one thing, two shall be in the bed, one shall be taken and the other left. That one that has been taken has not joined into the world like the other one has. There is a difference. They have peace of mind, peace in their heart. Thessalonians 5:1 now. “But of the times and the seasons, brethren, (Brethren, sisters. He is not talking to the world.) ye have no need that I write unto you.” He had already talked to them before. “For yourselves know perfectly that the day of the Lord so cometh as a thief in the night.” In Matthew 24:27, He comes as a thief. What is He doing there? He is going to catch something away, just as we read: one will be taken and the other left. But Matthew 24:29-30 was not as a thief, there was a great sign that appeared in the heavens first. “For when they shall say, Peace and safety; then sudden destruction cometh upon them, as travail upon a woman with child; and they shall not escape.” He is talking of the tribulation there. “But ye, brethren, (He goes back to the 1st verse, brethren.) are not in darkness, that that day should overtake you as a thief.” What he is saying, to some people, it is going to be like a thief in the night. Because people just disappeared. But ye brethren, are not in darkness, that that day should overtake you as a thief. “Ye are all the children of light, and the children of the day: we are not of the night, nor of darkness. Therefore let us not sleep, as do others; but let us watch and be sober. For they that sleep sleep in the night; and they that be drunken are drunken in the night. But let us, (Us. That is you and I.) who are of the day, be sober, putting on the breastplate of faith and love; and for an helmet, the hope of salvation.” Covered with God’s armor, protection. Armor protects the head and chest, because He knows these are your vital parts. “For God hath not appointed us to wrath, (They say this is the only scripture we have to go by to say we will be raptured before the tribulation. Dumb! They sure have missed the picture. God hath not appointed us to tribulation.) but to obtain salvation by our Lord Jesus Christ, Who died for us, that, whether we wake or sleep, (Whether we are in the ground or whether we are awake.) we should live together with him.” Together, that words comes back again, together. Why can we not get together now in faith? We are going to be together then. Let us go to Zephaniah 2:1. “Gather yourselves together, yea, gather together, O nation not desired; Before the decree bring forth, before the day pass as the chaff, before the fierce anger of the Lord come upon you, before the day of the Lord’s anger come upon you. Seek ye the Lord, all ye meek of the earth, which have wrought his judgment; (That is what we are doing now.) seek righteousness, seek meekness: it may be ye shall be hid in the day of the Lord’s anger.” What are you going to do about that? You study one part of a scripture and hinge everything on that without looking at anything else. You are wrong. Matthew 24:27-31 speaks of two comings. The first coming is as the lightning. A flash. In a flash you will be gone. Just like the lightning hits and it is gone. It does its damage, it can split a tree open, but then it is gone. Where did it come from? It came from heaven. Where did it go to? It went to the earth. As the lightning shineth from the east to the west. It is not just shining from east to west, it has a purpose. It struck something. It does something. God’s purpose is to do something. His purpose now is to do something in our lives to make us worthy of what is coming. The second coming in Matthew 24 is when the sign appears in the heaven. The first coming is to rapture his bride away, the second coming is when he comes back to rule and reign. Zephaniah 1:7. “Hold thy peace at the presence of the Lord God: for the day of the Lord is at hand: for the Lord hath prepared a sacrifice, he hath bid his guests.” Think about it today. We have been made guests. We are guests. If you bid somebody as a guest, you put them in a position. It is not just a drop-in. You did not just drop-in to this, you were called as guests. Called to be a part of something that is greater than what we are. Go to Revelation 4. In chapter 2 and 3 of Revelation we were shown the church ages, each one of the ages has people in it that are saved. Why is it that He says His coming will be as the lightning from the east to the west? It is to gather up all the saints. Just because China is what it is today does not mean it was always like that. I believe Mao Se Tung killed sixty-eight million Christians. Whenever that Communist government took over, there were believers in that number, there were unbelievers in that number too. But he killed sixty-eight million. India has had saints, that is where the apostle Thomas went and was killed preaching. He was killed on a hillside, a place where it was forbidden for Christians to go. There are many saints that have been part of the bride all over the world. Revelation 4:4, “And round about the throne were four and twenty seats: (This is Old Testament saints, represented by the twelve tribes and the apostles. John is looking at himself when he is looking at that.) and upon the seats I saw four and twenty elders sitting, clothed in white raiment; and they had on their heads crowns of gold. And out of the throne proceeded lightnings and thunderings and voices: (It is always that way round about the throne, there is always thunderings and lightnings and voices.) and there were seven lamps of fire burning before the throne, which are the seven Spirits of God.” What is not mentioned yet? The four beasts. We have gone over that. What are the four beasts? The four beasts each come forth whenever those horses begin to ride. Each horse is introduced by a beast, by one of the four beasts. Then the horse rider does his dirty work. The beasts are a representation of the church for each age of time. “And before the throne there was a sea of glass like unto crystal: (That is your life. This is not foolish virgins, because they come out of great tribulation. They have washed their robes and made them white in the blood of the Lamb. When John sees them at this time, he is seeing them before the throne. There you are, under that fourth beast, the eagle. The eagle represents the endtime church. Listen to it. Before the throne there was a sea of glass like unto crystal…) and in the midst of the throne, and round about the throne, were four beasts full of eyes before and behind.” That is the ministry that God has called, that God has chosen to lead his church in the dark days. “And the first beast was like a lion, (Like a lion because it could not be defeated. Put Peter in jail, he comes out. Put John in a barrel of hot oil, he survives. No matter what you are going through, you are greater than your trial. Why? Because you have the Lord Jesus Christ on your side.) and the second beast like a calf, (That was that bunch that were killing Christians. It was a beast of sacrifice. Right after the apostles had gone, they began gave their lives as sacrifices. They were persecuted, hunted, and killed. Even history says the seed of the church is the blood of the saints. The more they killed, the more they had to contend with.) and the third beast had a face as a man, (Which was under the time when Martin Luther, John Wesley and those came on the scene. The face of a man, because they were smart people. They could stand up to the theologians and wise men of the church world. They put John Wesley out of the Church of England. He stood on his mother’s grave and said, “The world will be my parish.”) and the fourth beast was like a flying eagle.” These four are the Bride of Christ, each one of them represent Bride. This last one stands out in the endtime. That is why we have been given so much. God sent a prophet. The world hated him. See what happened? Let me read verse 6 again, “And before the throne there was a sea of glass (which is the trials and tests and all they went through, the sea of glass means it was persecuted and tried. You are hated this morning because of the truth you stand for. Some walked away because it did not come like they wanted it to. If it had been some other man that had preached the third day, they would have accepted it. I will say something: if Deva Govender had preached it, the ones that left would have accepted it. But it was not Govender, and they could not stand it. This is something we have faced in this hour. These bride saints have gone through something, every one of them in our age, starting with Bro. William Branham. They went through their trials. It came on through Bro. Jackson. He went through his trials. He almost had a nervous breakdown. It put so much weight on him. He was in Missouri at a church where the Martin brothers were. They were friends of Bro. Jackson at one time, before church order came along. Whenever he did not go along with church order, he said “It is not in the Bible.” He said, “I will not even stand in the pulpit when I say that. But it is not in the book. Faith Assembly will not go along with it. But when we are at the Tabernacle, we will observe it.” Because he believed that God had sent a prophet. He believed the prophet’s message. If you did not go along with church order, it got so bad that if you were seen chewing gum, you were wrong. Some of you people know that. You were told by deacons, “Get rid of the chewing gum.” You could not even put a piece of candy in your mouth. I would have failed every service. Not necessarily candy, but something to help my throat. No, these saints are not going to go along with just anything because they have had a taste. They have had a taste of Matthew 24, verse 28. It tasted so good. This does not connect to Revelation 10, but it tastes so good, sometimes it kind of bothers your stomach. But the taste, you are going to keep eating. You are going to keep eating and forget about the belly. Some have had to walk in hard places, but we will overcome by the blood of the Lamb. Are you ready to go further? Are you ready for what God has in the future? We are taking it one day at a time, one week at a time, one month at a time, one year at a time, until we run out of days, until we run out of months, until we run out of years. Then we will run out of here! Are you ready? … continued in the next edition.